Gathering together years of baking knowledge in their first-ever cake book, America's Test Kitchen offers a comprehensive collection of recipes for any cake you can imagine�Cfrom better-than-the-rest yellow cake layers for birthday parties to fanciful creations and elegant holiday desserts. Cakes are the ultimate all-occasion dessert. 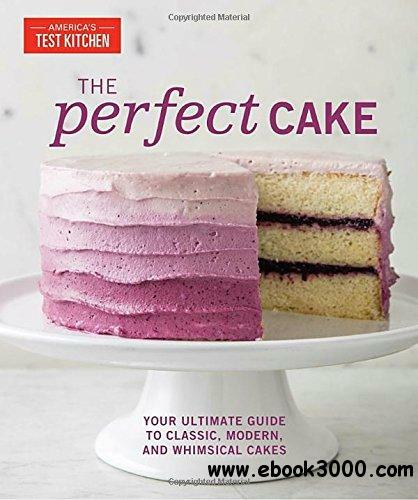 Whether you are looking for a party-worthy cake that's sure to bring smiles or a rustic treat for any time, America's Test Kitchen has the perfect recipe in this definitive guide to cake baking. The Perfect Cake opens with a valuable chapter of mix-and-match layer cakes, frostings, and fillings, allowing anyone to find just the combination they're looking for. The following chapters traverse a range of styles, touching on easy crowd-pleasers, sky-high stunners, American classics, holiday cakes, charming miniature cakes, and more. Rigorously tested to ensure the perfect outcome, these never-fail recipes will improve any baker's game, from White Cake Layers with an ultradowny crumb to a perfectly domed Pound Cake, a New York Cheesecake with a browned surface (and no cracks), and superlatively chocolaty Ultimate Chocolate Cupcakes. Discover new techniques and flavors with a Blueberry Jam Cake frosted in a stunning ombr' pattern, a sweet-salty Chocolate-Caramel Layer Cake, and a naked-sided Blackberry-Lemon Mascarpone Cake. And as only the test kitchen can, we fill the book with insight on everything from batter mixing methods to slicing cakes into multiple even layers.